The first group of the Russian sappers has arrived in Syria's Hmeymim base and soon will begin demining the liberated districts of eastern Aleppo, the Russian Defense Ministry told reporters on Dec. 3. "Along with the advance team, we have transported special engineering equipment," the ministry added. 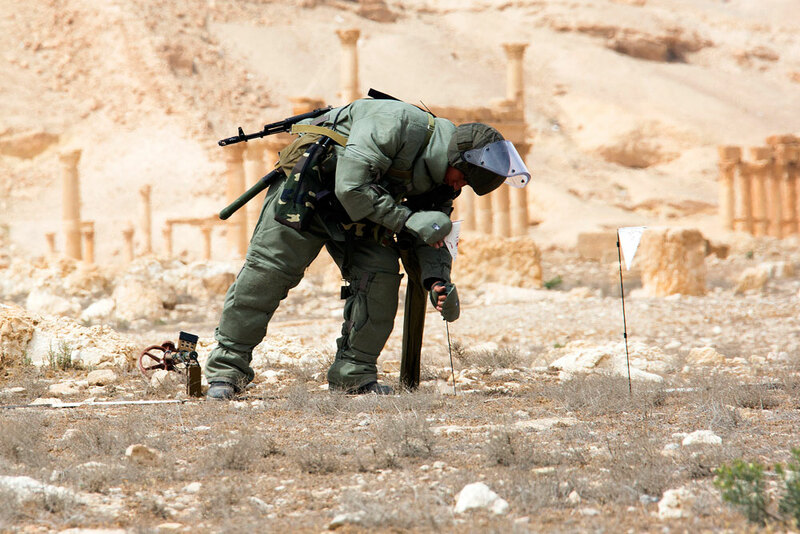 On Dec. 2, the ministry said that the center’s specialists took part in demining operations in Syria’s Palmyra. "The Russian military destroyed about 18,000 explosive objects and demined an area of 825 hectares. Apart from that, specialists of the Russian International Anti-mine Center demined 8,500 buildings," the ministry said. Syria’s government troops launched an operation to liberate Aleppo’s eastern districts seized by illegal armed groups in mid-November when the term of the latest ultimatum had expired. By now, more than 40 percent of Aleppo’s eastern districts with a population of about 90,000 have been liberated.